The PI’s Perspective: Ever Plan Ahead? How About Six Years Ahead? Things are going well out in the cold space between Saturn and Uranus where New Horizons is now. We’re deep in planning for our spacecraft’s annual checkout this summer, which begins on July 7. But that’s not what I want to write about today: instead, it’s something called EPDR. 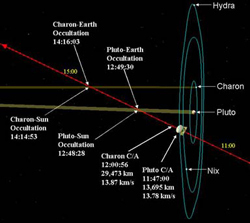 Despite still being more than six years and just over 18 astronomical units from the Pluto system, the New Horizons project team is conducting the second and final portion of our Pluto Encounter Preliminary Design Review (EPDR) today and tomorrow (May 20-21) at the Johns Hopkins University Applied Physics Laboratory (APL) in Laurel, Md. We conducted the first portion of the EPDR on January 7-8. EPDR part two is another two-day confab, in which the New Horizons technical and management teams will present the detailed, minute-by-minute timeline of our planned 2015 Pluto encounter to a review team of expert planetary planners from across the nation. EPDR represents the culmination of almost two years of intense encounter planning involving the entire New Horizons science and mission team, and the stakes are high — this is the main technical review of what will take place when we conduct the first exploration of Pluto and its satellites. You might wonder why we’re planning the encounter so far in advance — after all, it won’t start in earnest for just over 5 1/2 years, as we begin our approach in early 2015. 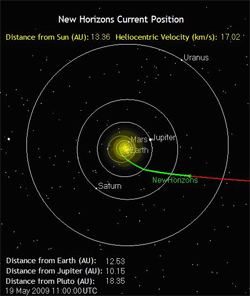 In fact, when we first proposed and designed New Horizons, we didn’t set out to do this work until 2012-2013, which would have been in time to test the sequence on the ground and then in a flight rehearsal, before the curtain on this historic first exploration of an ice dwarf planet and its system of moons begins. But in early 2007, as flight planning for our Jupiter encounter culminated, one of our lead science-sequencing gurus, Ann Harch, lamented to me that it was too bad that we had to wait five or six years, getting rusty all that time, before planning the Pluto encounter. New Horizons is far beyond Saturn and more than a billion miles from anything else manmade except for our STAR-48 upper stage rocket and some associated pieces of hardware launched onto a similar trajectory as our spacecraft. I discussed this idea within the team, and people really liked it. Our project manager, Glen Fountain, of APL (where New Horizons was built and is now operated), took it to NASA for approval, which was granted in the spring of 2007. NASA’s approval did come with a catch: the agency was willing to spend some of our funds sooner to pay for the encounter planning in 2007-2009, rather than in 2012-2013, but we would get no additional money (over what we’d originally planned to spend), and we would have to finish the main portion of the planning by the end of 2009 in order to remain on budget. Glen and I thought that was a pretty good trade and we accepted the challenge. So beginning in summer 2007, we set out to plan an encounter that was (then) still 2 billion miles and almost a decade in the future. First off, the science team, led by our Pluto Encounter Planning (PEP) team boss Leslie Young, picked the best possible arrival date in mid-2015. The result — July 14, 2015 (Bastille Day!) ­— gave us the best combination of viewing Pluto and its three moons of any day within the range of dates our fuel supply could allow us to reach. Next, the PEP team optimized the flyby closest-approach distance to best study Pluto and all three of its known moons — not too far away, lest we lose resolution, but not too close lest we crowd the pace of events in-close and smear images. In the end, we chose a closest approach 12,500 kilometers from Pluto. Following that, PEP began detailing how every scientific observation would be carried out by the various scientific instruments on New Horizons — from mapping to composition studies to atmospheric escape, and on and on. Then we wrote down all of the timeline requirements needed to fit these observations together, and traded or strategized our way out of the competing desires of our various instrument and science theme teams. Next, we integrated hundreds of scientific observations during closest approach into a carefully choreographed encounter, feathering into that plan all of the final approach navigation, trajectory correction maneuvers, and communications requirements, and fitting all of this into the available command space memory, data recording memory and fuel budget..
We also added backup observation opportunities for the most important science so that if a given observation failed, we got at least a second shot at it. We added a few artistic image sequences, such as family portraits of Pluto and its moons as we approach and as we depart. This highly integrated and exquisitely choreographed plan was then tested on our mission simulator. Having passed that milestone, it will be reviewed and critiqued by outside experts in the EPDR review on May 20-21. Following the EPDR, we will wake up New Horizons for its 2009 checkout this July and August, and then we return to encounter planning for the remainder of the year. 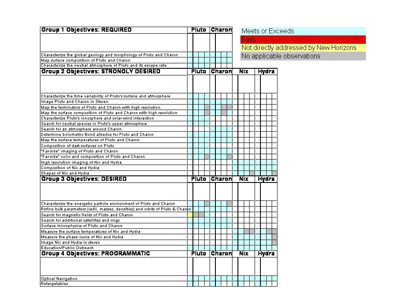 So in the fall and early winter we will be finalizing the near encounter sequence by accounting for the actions cited by the EPDR review board and by also knocking off all the fine details of punch list (“to do”) items that we ourselves still have to clean up before we put the plan in the “can.” There it will sit until 2013 or 2014, when we gear up for a full flight rehearsal of the central nine days around our closest approach. What is in store for the encounter? We have approximately 30 specific scientific objectives planned — from surface mapping to composition mapping to atmospheric studies to searches for new moons and rings. 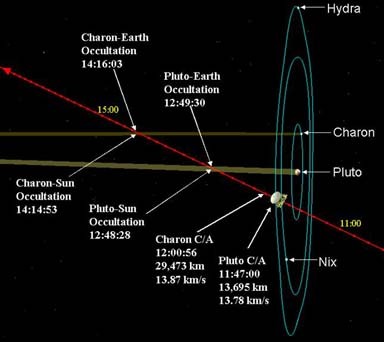 And in just the central nine days around closest approach, more than 380 observations are planned of Pluto, its moons, Charon, Nix, and Hydra, and the space between and around this system. 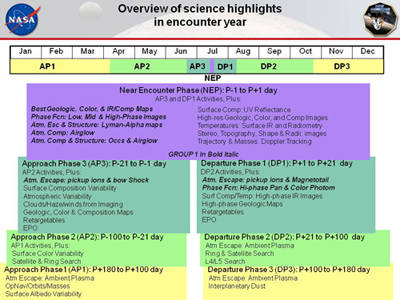 And although the pace of activity and the highest resolution datasets will come in that nine-day “core encounter” period, the entire encounter will last from January to July 2015. This will allow us to see Pluto and its moons in more and more detail as we fly up to them, and to study the way their surfaces and Pluto’s atmosphere varies over this long time span. 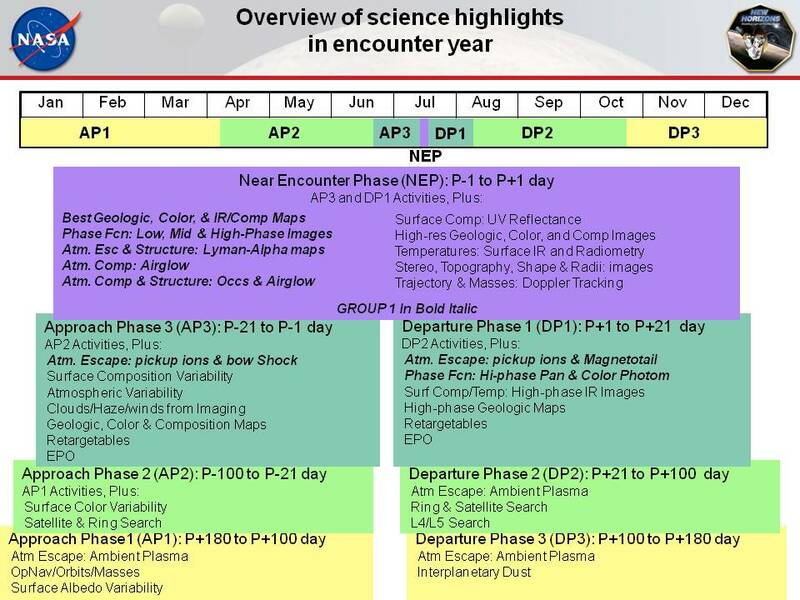 The figure just below is a top-level view of how we sorted our various science objectives into the encounter’s Approach Phases (APs), its Near Encounter Phase (NEP) and our Departure Phases (DPs). 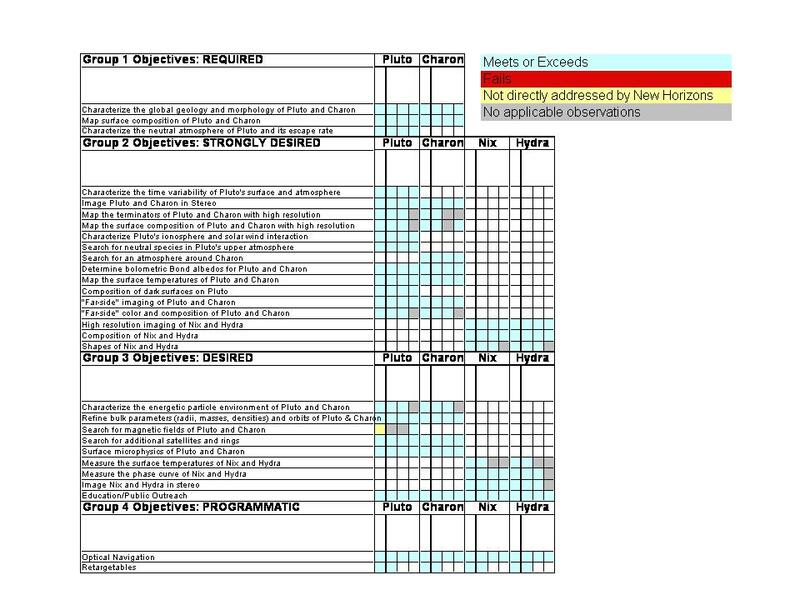 And the figure just below is a scorecard for how the detailed, minute-by-minute sequence our science team and planners have put together, meets or exceeds the objectives set for us by NASA many years ago. What I’ve been able to tell you is just a top level summary of planning the team has conducted for our encounter, still six years hence. We’re anxiously looking forward to that day — in the middle of the coming decade — that will open up for study a new planet and whole new class of planetary bodies — the dwarf planets — on the unexplored frontier of the solar system. Well, that’s it for now. I’ll be back in touch just before we begin spacecraft annual checkout in July. In the meantime, keep on exploring, just as we do!